Among the best and most enduring music of this century are the popular songs of the 1930's, 40's and 50's. Every history of popular music pays homage to one of the most celebrated vocal ensembles in Western music. The Ink Spots "were the most popular and influential black vocal group in show business in the thirties and forties" according to the Faber Companion to Twentieth-Century Popular Music. 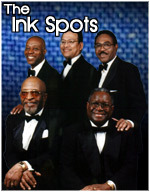 The Ink Spots, during their prime recording period (1939 to 1951) had 50 hit records with 11 of their songs reaching the Top Ten between 1940 and 1949. They were awarded a Grammy in 1988 for their signature song "If I didn't Care," which has sold more than 19 million copies. Some of their other great hits included "When The Shallows Come Back to Capistrano", "We Three", "Java Jive", "Don't Get Around Much Anymore", "Address Unknown", and "To Each His Own". In 1989 the group was inducted into the Rock and Roll Hall of Fame. When they started singing together in the early 1930's, they were working as porters at the Paramount Theatre in New York City. At first they called themselves King Jack and the Jesters, but when the Paul Whiteman Orchestra introduced a vocal group with a similar name, a new title was necessary. However, finding a suitable name was not easy and the four vocalists and their manager agonized over it for hours. The manager had been doodling with his pen, which eventually went dry. He shook it, producing four ink blots on the page - the stuff of legend.